ETC Fire offers you qualified professionals to carry out the essential checks that are required by law for your fire extinguishers in any commercial or domestic situation. Fire extinguishers don't come cheap and there's no point in paying for the latest equipment if it hasn't been checked and assessed as fit for the job at the regular intervals specified by the HSE. Some fire extinguishers require checking every six months and others every two years or so. The discharge test must be carried out also at required intervals which vary with different types of fire extinguisher. 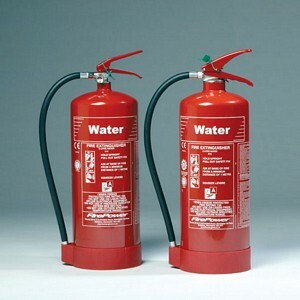 Ensure that you have complied with all the requirements around fire extinguishers and fire safety. Our contractor can also advise you of any further requirements from the HSE. Yearly Servicing is essential to maintain your equipment in good order and remain compliant with HSE regulations and the current safety standards. An empty fire extinguisher really is worse than useless, and could result in an insurance claim being made against you should your people be unable to use it in a fire. Fire extinguishers should be left in a place where they are unlikely to be tampered with but easily accessed in the event of a fire. Our fire extinguisher maintenance operative will be able to advise you on what anti-tamper devices are appropriate for each situation and how/where to store your fire extinguishers. Your yearly fire extinguisher servicing agreement will ensure that your fire extinguishers are in good working order and also check that they are being stored correctly. After five years your fire extinguishers will require an extended discharge/recharge test, which will involve them being disassembled, or exchanged for new ones. When your fire extinguishers are checked your service engineer will leave a label on the fire extinguisher with the test date and details. This is your Fire Extinguisher Maintenance Record. You should not remove or cover over these labels, as they form a legal, documentary record of the history of the unit. ETC Fire offer a fire extinguisher maintenance Kent areas - please contact us if you would like a visit.